Prototype: German Federal Railroad (DB) class 191 older design electric locomotive. Rebuilt version with small headlights and without sun shields, in a chrome oxide green basic paint scheme. Road number 191 101-5. The locomotive looks as it did around 1970. Model: The locomotive has the new mfx+ digital decoder and extensive sound functions. It also has controlled high-efficiency propulsion. 3 axles powered. Traction tires. The engineer's cabs and the engine room have interior details. Grab irons and other details are separately applied. The locomotive has detailed roof equipment including separately applied roof walks. Triple headlights and dual red marker lights change over with the direction of travel, will work in conventional operation, and can be controlled digitally. The headlights at Locomotive Ends 2 and 1 can be turned off separately in digital operation. When the headlights at both ends of the locomotive are turned off, then the "double A light" is on at both ends. Maintenance-free, warm white and red LEDs are used for the lighting. Length over the buffers 19.9 cm / 7-13/16". Rebuilt lighting with white and red LEDs. Authentic representation of repaired areas and weathering. Figure of locomotive engineer in Cab 1.
mfx+ digital decoder and extensive operation and sound functions included for still more operating enjoyment in the Märklin "World of Operation". These new functions are only available in conjunction with the Central Station 2 with firmware version 3.5 and higher. 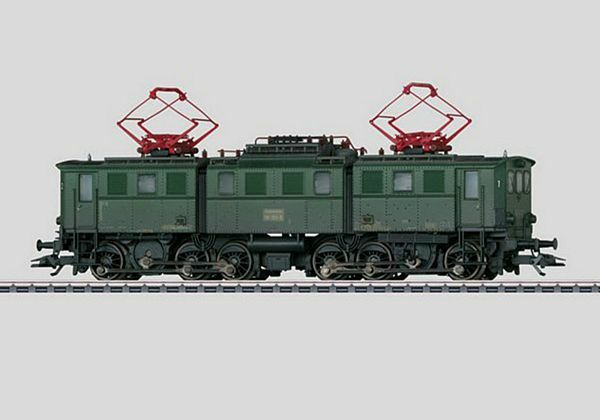 This model is being produced in a one-time series only for the Märklin Dealer Initiative (MHI). 3rd locomotive in a series of 5 locomotives with authentic weathering. A freight car set with dump cars to go with this locomotive is also being offered under item number 46316 exclusively for the MHI in the Märklin assortment.